One of the first things to do when starting out on a new One-Name Study is to construct some core data sets. Apart from being a requirement set by the Guild, there are several other reasons why it makes sense to do this. The initial Ruby team constructed core data sets for several countries: notably Canada, England and Wales, France, Ireland, New Zealand, Scotland, and the USA. The original England and Wales data set chosen was the 1881 census. We thought it might be interesting to add in births, deaths and marriages from the national indexes. While not absolutely perfect, they are a terrific resource stretching back to 1837 when modern recordkeeping began. This data is, I think, without parallel anywhere in the world. Paul Featherstone recently related on a Guild webinar how it took him ten years to construct these core data sets for his study from his occasional visits to the repository in London. He started twenty years ago, before the internet and only managed to collect data for years from 1837 to 1900. On the same webinar, I told how doing the same thing ten years ago for 1837 to 1940 took me a couple of days using copy and paste from the FreeBMD website. I then related that “for a new study” (this Ruby Study) it took all of ten minutes to do the same thing for 1837 to 1980. - the age at death is not shown for deaths between 1837 and 1865. Both of these shortcomings have been largely fixed by new indexes issued by the General Register Office. The new indexes also show the full name for every person, though they aren’t as customer friendly to use as FreeBMD. Thus for anyone conducting a One-Name Study with people in England and Wales, you cannot ignore the new index. - I added no fewer than 53 new entries. I was honestly shocked at how many there were. See the two examples in the boxes. Box 1 shows all Ruby births in 1872 from FreeBMD, one boy and three girls. 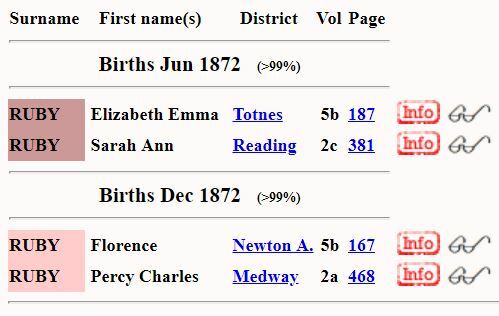 Box 2 shows five female births for 1872 as listed in the new GRO index. There was a similar pattern with the death entries, with 133 deaths from 1837 to 1865 in the blended index. This number includes 21 entries not in FreeBMD and only 5 in FreeBMD but not in the GRO index. Now, until we finish building families for England we will not know for sure what the cause of this is. I did observe that there were some registration districts which seemed to be the primary origin of most of the extra entries. These included in alphabetical order: Bolton, Goole, Lancaster, Lincoln, Manchester and, most of all, Wigan. They are all in the North of England. As a surname, Steve Archer’s Surname Atlas shows that Ruby was relatively heavily represented in the South West and South East of England in the 19th century. Consequently, the increase in numbers from the North of England is even more dramatic than might at first appear! Maybe there are Rubys in the index who aren’t Rubys, or Rubys excluded from the index altogether. So, until we figure out whether the cause is particular to the Ruby name, if your surname is heavily concentrated above a line from the Wash to the Mersey, I suggest you pay particular attention to the new index. My working assumption is that there are some gaps in the FreeBMD transcriptions for some reason. It could also be that there are several people named Roby (a name concentrated in Lancashire) who have been transcribed as Ruby in the GRO index. One of the extra girls in 1872 mentioned above was a Roby in FreeBMD, for example. Time and analysis will show. One major caveat to the working assumption is that during the course of adding mothers’ maiden names to the indexes before 1911, I found considerable variation in those transcribed surnames. In fact there were so many variants in mothers’ names for what were obviously the same families it made me doubt the accuracy of the transcription of the Ruby family name itself! So we will need to revisit this whole analysis once we have finished family reconstruction for that time period and have identified every individual named Ruby and those who aren’t Rubys! Thanks for your extensive comments about the lessons learned, Paul. For those of us who've stumbled and fumbled our way from paper to computer, these challenges are ever so familiar! I'm one of those who signed up to all of this one-name mullarkey just at the point when the impact of IT was disturbing the gentle but steady growth of knowledge through the vigorous pursuit of paper archives. As one of the geeks myself, the use of technology seemed an obvious way to accelerate development in a data-hungry pursuit. But what you're now uncovering is the issue of 'data quality'. Anyone can post anything on the internet and it's 'data', right? Well, obviously, no. FreeBMD (and I use it a hell of a lot) is a volunteer-driven site. Implicitly, the 'data' seen is the result of one volunteer's transcription of a document, and we're all human so it could be open to another interpretation. The scans that are the source of the transcriptions are often low quality, and a poorly printed 'o' could easily look like a 'u', and vice versa, so your problems are easily understood. By the way, there is no guarantee that the GRO are employing people who have some sort of supernatural clarity so that their transcriptions are 100% reliable. So - for me, the lesson in your blog is to avoid the temptation to take one single record as the proof - it's evidence, sure, but not yet proof until, that is, you can find something to corroborate it; something that makes you totally sure. So, while I, personally, have so unusual a name that it's very nearly 100% unique (note the "very nearly"), is it enough to assume that I am the husband of the woman recorded in the GRO marriage indexes who married someone with that same name? And, finally, this sounds like fun - can I help? Thank you, Howard. I agree. Sorry it took a week for me to notice! I'll be in touch. Interesting (and disconcerting) to see so many discrepancies between FreeBMD and the GRO Index, particularly in the Bolton and Wigan areas. I have a lot of Bolton and Wigan BMDs in my own one-name study, but only a few discrepancies. However, I think I may have identified mistranscription as a possible reason here: the surname ROBY is particularly common in Lancashire (486 out of 730 ROBYs are in LAN in 1881). FreeBMD has your 'missing' Mary RUBY b 1872 Q4 Wigan 8c 97 listed as ROBY - which is her correct surname as confirmed from the original GRO register image. I suspect she, and a good many other Lancashire RUBYs on your list, can be deleted since they are actually ROBYs.